Here's a versatile telescope designed to pack up and go whenever you hit the road, the trail, or the air. It excels for daytime birding, nature study, and scenic long-distance viewing, and will take you way beyond the Earth's horizon after sunset for some casual nighttime stargazing and Moon-watching. The 70mm GoScope II features a 70mm-aperture achromatic lens system for high-resolution images of distant subjects. The telescope sets up in seconds on the retractable aluminum tripod which features a three-way pan head and allows smooth, easy pointing of the telescope. 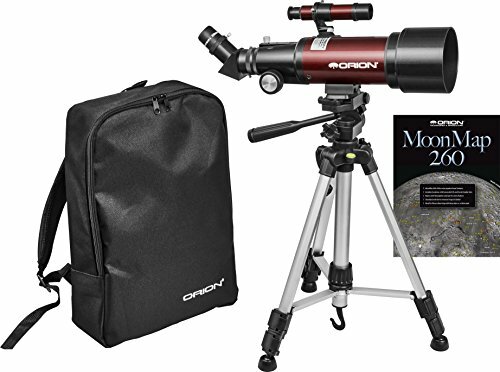 It comes with a correct-image prism diagonal, anti-reflection coated 20mm and 9mm Kellner eyepieces (1.25"), MoonMap 260 and a 5x24 finder scope. It's a complete observational system that tucks away neatly in the included backpack!